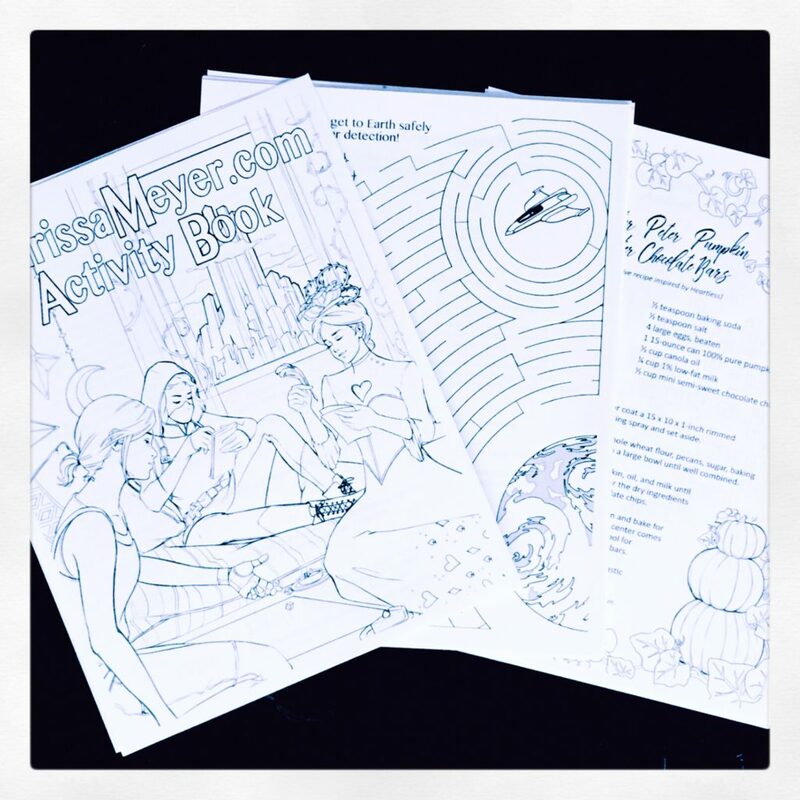 Get Your Free Printable Activity Book! You know those cheesy activity books you would get when you were a kid, usually before going on a long road trip? The kind with mazes and coloring pages and little tic-tac-toe squares? Well, for years I’ve had this crazy idea about wanting to create one of those for fans and readers of my books, as a THANK YOU for your enthusiasm and support. And I am thrilled to say that my little dream has come true! I had the great joy of collaborating with Kathryn Gee (the artist behind The Lunar Chronicles Coloring Book) on a series of fun book-related activities, and our booklet is now ready for your enjoyment! The booklet is printable and shareable, and I encourage readers to print out as many copies as they would like for themselves and other YA readers. I would also LOVE to hear from teachers, librarians, or book clubs who might use the activities in conjunction with themed parties and events, too! To receive the booklet, just subscribe to my newsletter. You will automatically be sent a downloadable .pdf link. Thank you so much for sharing!I hope it helps a lot of people. I LOVE the crossword puzzle! (and all the illustrations of course, but) THE CROSSWORD PUZZLE. There are so many inside jokes/puns in the hints, and some of them were kinda tricky! You really have to be a close reader/have a good memory for some of them. And I like that you included things from even Stars Above and Wires & Nerve! I LOVE THE COLORING PAGES! In these activity books you will get many project for kids to do coloring in the designs made on the book. Also, there are blank pages in which you kids can create pictures on it and then add color to it. That’s why these books are really important. I love this booklet. look so beautyful! In my advice, not numerous bloggers own so many suggestions to make latest, fascinating posts. Thanks for performing it and I desire you didn’t lose the motivation to make the new ones! I completely accept with the earlier viewer. I think the awesome inspiration and good reviews are wonderful foundation to establish high quality content. I have forever asked yourself how to create top superiority materials and distribute them on the website. Today I should state that the duty isn’t for me. I allow it for professional writers. Now I feel nostalgic about my childhood. Wonderful colorful books. We followed them to the library or took them from friends and acquaintances. I remember that I learned to read quite early. Already in the senior group of the kindergarten, they constantly ran up to me with requests to read. Many books encouraged me to become a writer of children’s literature, and now I improve my skills and write already for a more adult audience – for schoolchildren and students. Nostalgia is totally natural and good. You must be encouraged by the memories.